Every year when the Canadian National Exhibition rolls around there are inevitable articles asking if it still matters. Can it compete with Canada’s Wonderland or the internet? It’s an unfounded worry — and I’ve written some of these annual articles — as every year the crowds prove that, yes, the CNE is still a vital part of Toronto. It may have something to do with the temporary nature of the CNE, here for a couple weeks in the latter half of summer, marking the passage of time in the city. It’s also a place that attracts a wide cross-section of society, where low and high culture is often side by side in a true city mix. This year, a photo exhibit called “Snapshots of Change: The Influence of the CNE on Toronto,” mines the CNE’s massive archive and looks at how it and the city that has hosted it since 1879 have reflected each other. There is a sense of melancholy looking at the photos, as many buildings didn’t survive, sometimes succumbing to fire or bulldozed for new ones. Even the construction of the Gardiner Expressway lopped off the northern edge of the site, destroying some buildings along the way. A 1929 map of the site on display in the exhibit depicts a busy city within a city and photos of the “Crystal Palace” and the “Shell Tower” illustrate what’s been lost over time. The photo exhibit itself is housed in Withrow Common, a new event space in the Queen Elizabeth Building, a 1957 structure designed by Peter Dickinson, perhaps Toronto’s most swashbuckling, Mad Men era architect. Apart from the buildings, the Snapshots of Change exhibit shows the scope of the events that took place over the years: there were “Grandstand Spectacles” that looked like massive operatic productions; a Jackson 5 concert in 1971; “Toronto’s answer to the Rockettes,” the Canadettes; and the colourful Aquarama show, the water ski performance that is returning to the CNE this year after a long hiatus. Cherayil says she’s met some of the women who performed decades ago who now have descendants performing today, making it a family affair. 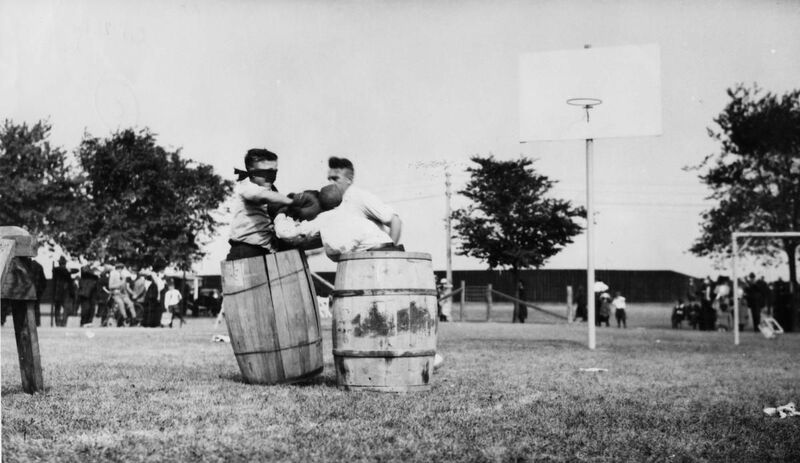 Other photos reveal an honest Toronto, like the picture of barrel boxing from 1920, where people were blindfolded, put in wooden barrels, and left to pummel each other with boxing gloves, as if a precursor to driving in Toronto today. Another photo shows the “Freak Show,” a human attraction that ran until 1971, perhaps not comfortably far enough in the distant past. Most compelling is a photo of the 1954 midway burlesque show called “STRIPORAMA.” Though the “Toronto the Good” reputation suggested this city was a prudish, uptight place, there was always a libidinous side to the city with the many burlesque parlours found around downtown that existed in plain sight. That the CNE itself, an ostensibly family-friendly kind of place, reflected this is a sign of how deeply apart of the city this kind of activity was. With our collective civic memory intimately connected to this place, it’s hallowed Toronto ground and should be treated as such. While the CNE, officially the Canadian National Exhibition Association, runs the two-week fair and this photo exhibition, they are just tenants of Exhibition Place, a separate, city-governed entity that controls the site year round and has done a poor job of preserving history and living up to this noble heritage. Structures like the great 1936 art deco band shell are surrounded by parking much of the year, the “Garden of the Greek Gods,” sculptures by artist E.B. Cox, were fenced off from public view by the Musik nightclub a few years ago, and the recently opened Hotel X remains an ugly canker on the Toronto waterfront. Apart from the buildings, Exhibition Place has locked out 400 members of the International Alliance of Theatrical Stage Employees (IATSE) Local 58 since July 20, and are hiring outside replacement workers. The Snapshots exhibit, and the rich archive it came from, are a reminder that it shouldn’t be this way.